Dina Santorelli asked me guest post about offering “One Final Night” free to readers. Read the full post here. What do you think when you see something offered for free? Does it alter your perception of the writer/provider? Do you then expect to get everything from that person for free? Just a quick post in reminder that today is the last day to get Come the Shadows for 99 cents! The short story One Final Night (which now has a few more 5-stars on Amazon!) will remain free. My worst fear was that when I published I would wake up one day and be inundated with 1-star reviews declaring me the William Hung of self-publishers. As yet, it hasn’t happened. But I did receive my first 1-star review yesterday, on the short story One Final Night (which has now been downloaded 23k+ times). My heart skipped a beat and I groaned when I saw it. I really didn’t even want to read the criticism, but I soldiered on. The problem is the story is depressing and discouraging and unlike other reviewers the ending was not enough to save it for me. Too little to late! While it’s hard to see a 1-star pop up, I understand that it’s a tough story where the most common reaction is profuse tears and hugs and kisses for your loved ones. It’s supposed to be hard. It’s supposed to be thought-provoking. As Lisa Vaughn (@thegiftedones) said on Twitter – not every story can have a happy ending. It’s a bummer, but it’s just the way it is. Stories not only do – but need to – represent all facets of life. Ironically, I tend to avoid tear-jerker, sad stories myself. I watched Message in a Bottle in the theaters and refuse to watch another Nicholas Sparks offering. I can’t stand such a sustained level of raw emotion. But I give him 5 stars for the work because it did exactly what it should – made me bawl my ever-loving eyes out. The problem is not that the author can’t write, because she certainly can! …books that have unhappy endings just do not appeal to me, I hope the author takes that into account in future offerings because she is a good story teller who I would read again if her stories are more positive and uplifting in some way! Those were some nice compliments, hidden in the paragraph, and I hope they stand out to others who read her review in the future. Honestly, if this review helps other people who dislike hard endings stay away, maybe that’s not entirely a bad thing. I want people to enjoy the writing and if, for some people, the quality can never overcome the ending then there is nothing I can do about that. But I’m glad to see the quality acknowledged, even under the 1-star heading. This officially scuttled my plans for a post about review jitters, inspired by this post I saw linked on Facebook yesterday. I’m still a bit jittery without much chatter on Come the Shadows (and who wouldn’t prefer everyone to LOVE what you write) but I am just taking this a sign it’s time to get to work on that thick skin that’s been on my to-do list for, oh, 20-25 years. PS: As for the suggestion in the review that all the 4- and 5-star reviews are all just people I know… Nope! 12749 people have downloaded One Final Night from Amazon, and a few of them have even taken the time to give (very nice) reviews. I know it’s a drop in the bucket, and some people actually sell that many copies of something in the same amount of time but it’s really gratifying simply to have a small piece of work get in front of a lot of eyes. And there are many other eyes I can’t even count. I published the short story on Amazon and Smashwords only, and the later sent it to Barnes & Noble. As a consequence, I have no idea how many people have downloaded it from B&N and I never will, as far as I can tell. But a couple of days after it became free the B&N ranking was around 50k. Now it’s 18k. (They don’t separate free/paid). I like that climb. Honestly, I don’t know. I lost all perspective on numbers somewhere around 5,000. Has it translated into mega-awesome numbers of people purchasing my discounted Come the Shadows? I plan to leave the short story free indefinitely, and Come the Shadows discounted through the end of August, when it will then return to $2.99. My hope is simply that more people take the time to read the work and consider the longer piece. They are not in the same genre, but I hope it gives a hint of my writing and show’s the value therein. I posted this weekend that I was reducing the price of Come the Shadows for this weekend only. 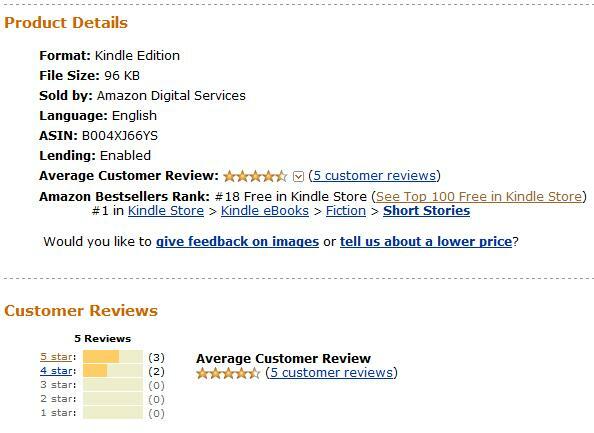 “One Final Night” is now #18 out of all free downloads for Amazon Kindle (and doubled in rank at Barnes & Noble). I’m overjoyed to see that! In addition, it has garnered several reviews and all have been 4 and 5 stars. Wonderful! In light of that I have decided to hold over the 99c price at least through the end of the month. With so many people learning my name I want to seize every opportunity to ensure the most number of people can pick up the book as well. (It cracked the 10k rank for the first time, hitting as high as 9155ish last night.) I hope a few people can soon take the time to put up reviews there and share their enjoyment with others! Every review (and EVERY reader) is very much appreciated. My enjoyment is leading to an extensive screenshot collection as I see happy new milestones. PS: The daily writegoal is holding and I should be more than 1/2 way finished with book two at the end of August. After Amazon finally listened and made my short story One Final Night free (totally KO’ing my planned REPORT ME PLEASE post), I decided to drop my book in price for this weekend only. So for 99c you can it up for both Kindle and Nook for the next 48 hours. Monday it returns to $2.99. As always, reviews on both are VERY welcome – word of mouth, especially on those pages, really helps the writing thrive and reach new fans. Thank you to everyone who picks up the book and I can’t wait to bring you the next one in a few months! In other news…. it seems Barnes and Noble is now carrying my paperback, and it’s $8.99 – a full $1 cheaper than Amazon. Whoa. I just write things. That’s all I know.